Do I need something like this, or can I just cut my liPo battery's wire and solder it directly on the lilypad. I'm using the 850mAH Polymother Lithium Ion battery. I would like to attach a solar cell to a Lipower in order to charge the battery attached to Lipower. Do you think the battery can handle to be charged with variable voltage? Thanks! I got the impression in another thread that there could be a problem connecting the USB programmer to an Uno while it was also connected to a LiPower board with a battery. Is that the case with the LilyPad and this board, or is it OK to have both USB and LilyPad LiPower connected to my LilyPad at the same time? Thanks! Noob question, but what is this product intended for? Can it be used to light up LEDs without a LilyPad main or simple board? 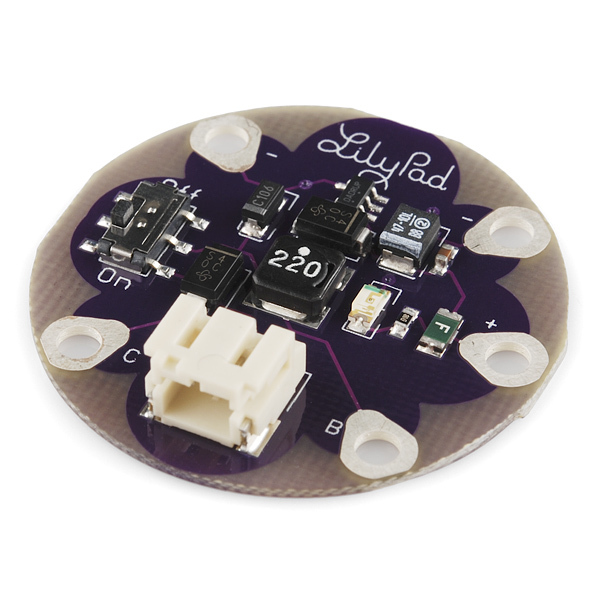 OR is it just to give the lilyPad a steady 5V? Both. You would need to make sure your LEDs can handle 5V, and you would only be able to turn them on or off, but yes, you could run just LEDs or actually power a main board off of this. 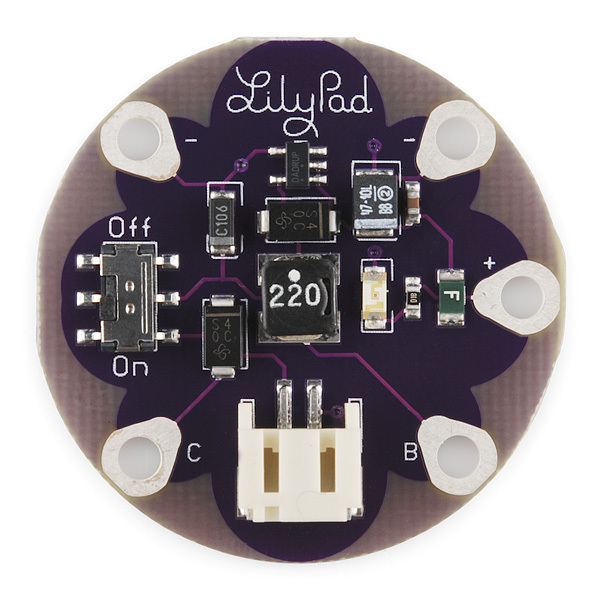 The simple power does not have a built in battery, you use your own battery and the simple power makes it useable for LilyPad. Member #542698 as far as I can see, the "LilyPad LiPower" does not have built in battery neither, so I still keep the same question: What's the difference between "LilyPad LiPower" & âLilyPad Simple Powerâ? The LiPower boosts the 3.7V signal from the lipo up to 5V. The Simple Power just outputs 3.7V. I am a little confused. Under 'Dimensions' it says 18mm OD but in the photo it appears to be considerably larger than the standard 24.2mm size reference. What's with that? Is the LiPo good for 150ma or 100ma? - The description says 150ma, however the schematic says 100ma. I am an industrial designer student designing a female scooter jacket with LED's. I am looking for power sources, and as my knowledge in electronics is limited I am addressing my questions to you. I have purchased the power case DEV-11259 for the AAA battery. I have 4 circuits with respectively 40, 32, 30 and 16 Lilypad LEDs (in parallel). From the LED datasheet (the DEV-100-series), I see that forward voltage is 2V. 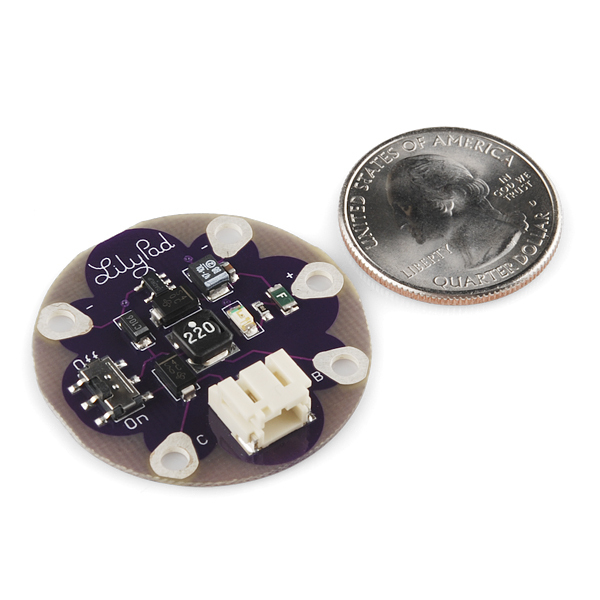 Since I have 4 circuits, do I have to use 2 Lilypad micro controllers? The 4 circuits have to be independent of each other. Maximum number of LED's on at one time is 102. The number of LED's can be adjusted down if necessary. I recon the rechargeable Lithium would be better for this application since it says that it lasts longer. 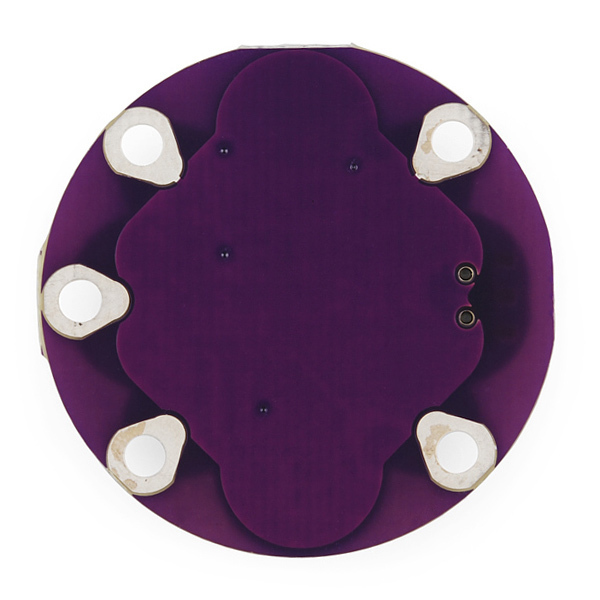 I wonder, is 102 an incredible high amount of LED's for one Lilypad LiPower source? How long will the power source last with 102 LED's on? Or X LEDs? I will be happy to send you a schematic of the jacket. How sturdy are the LEDs? Can they really last the 1000 operation hrs when placed in a jacket and with the use that comes with a jacket? Also referring to the recommendation of using the LEDs within 1,5 year after purchase. Another question: Do you provide LEDs that can be clipped onto a textile circuit instead of sewn on? In that way, I think it would be easier to change LEDs after their operation life, or in case of a defect. Did you ever figure out the answer to this? I want to light up 20 lilypad white LEDs in parallel and am wondering whether this power source will work and how long the battery will last if it will. I'd recommend asking in a forum!